Get Out of Debt? Why? 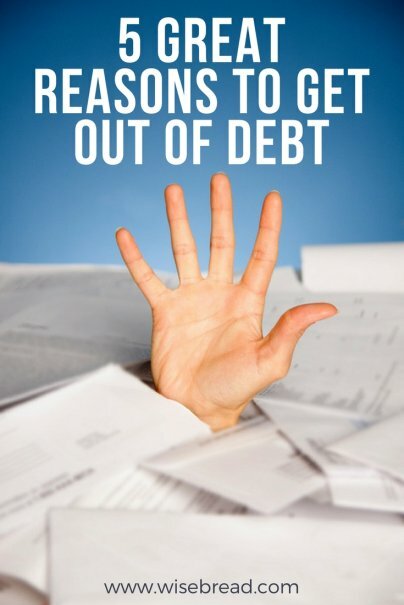 Home » Personal Finance » Debt Management » Get Out of Debt? Why? I spend a lot of time writing about why debt is bad news. As a result, I’ve actually gotten a lot better at avoiding debt in my own life and paying off any debt I do take on as quickly as possible. I guess I believe in my own advice. But sometimes I have to wonder — I know a few people who carry a lot of debt, and it just doesn’t seem to faze them that much. They have a nice life, a lot of nice things, and they pay for it all in installments. Is that really so bad? If carrying debt doesn’t bother them, why would they bother making it go away? If you carry a lot of debt — especially high-interest debt on credit cards — it costs you money each and every month. Let’s say you have the same balance as an average American with a credit card, $15,596. At a typical 18% interest rate, you’ll pay more than $9,000 in interest before you pay off the debt, assuming you make a minimum montly payment of 4% (which, if you don’t aim to pay that debt down, is the most likely course of action). That’s $9,000 for absolutely nothing. If your employer took that off your paycheck, you’d be screaming bloody murder. So why would you do it to yourself? If you’re carrying a debt with a manageable payment, it’s a cycle that can often be perpetuated for a very long time — pay it down a bit, rack it up a bit, and repeat. But that cycle can quickly collapse in the face of emergency. What if you lose your job, get sick, or run into a major unexpected expense? The likely result is that you’ll fail to make your payments, and possibly default on your loan. That’s bad news for you credit and, ultimately, its bad news for you. Not only will you be cut off from borrowing for a while, but bad credit can even get in the way of renting an apartment or securing a job. And being in debt doesn’t just have negative consequences — it can also keep unexpected opportunities just out of reach, such as the chance to travel, invest, or start your own business. If you’re debt free or, better yet, have some cash in the bank, you’ll have a lot more freedom to be spontaneous and embrace life’s good surprises while creating the financial security you need to keep the bad ones from destroying you. You know that churning feeling you get in your stomach when you get your credit card statement in the mail? That’s not indigestion; it’s stress, and it can seriously affect your health. A 2008 poll by the Associated Press and AOL Health showed that people who were dealing with mountains of debt were more likely to report health problems such as ulcers, migraines, anxiety, depression, and even heart attacks. It’s easy to swipe that credit card and forget about it, but there’s always a point where a debt becomes too big to ignore. Unfortunately, by the time you feel the heat, you’re probably already in very hot water. If you can, get out of debt before it starts to keep you up at night. By the time it gets that bad, it may already be too late. Whether you make the move to get out debt is up to you, but don’t fool yourself into thinking that your debt isn’t a problem. Just like the charges on your credit card, you can only defer the consequences of carrying too much debt for so long. Eventually, it’ll be time to pay the price. Uh, your math is wrong on your credit card example. Assuming your credit card balance stays fairly constant at $15,596 (you make minimum payments but charge a little bit), at 18 percent it comes to $2,807.28 per year. A MUCH bigger reason to not do this. That's $233.94 per month, every month, for the rest of your life, if you hold the balance steady. You've reduced your available spend by $234 a month forever, until you start paying it off. Thanks for the catch, Kenneth. Tara was assuming a 4% minimum payment with no new charges -- I updated the example accordingly. 1. It stays about the same level, you pay the minimum payment, but charge some items, and it stays about the same. Pain - it never gets paid off, and costs you $233.94 a month. 2. It increases over time. This is probably most typical, as it is the easy way out, to not deny yourself the next purchase, what the heck, you're already in debt up to your eyeballs anyways. Pain - it gets worse, and your interest costs get worse. 3. It decreases over time. You have woken up, and are making more than the minimum payments and/or are not charging anything more. Pain - it takes a long time, self denial, self control etc. to do this. 4. You walk away from it, negotiate a payment plan or file bankruptcy. Pain - creditor calls and harassments, garnishment, inability to buy a car or home, the ruination of your credit rating for 10 years. Correct answers: numbers 3, which is best, and 4, which is best if you are hopelessly over your head and don't have the wherewithal to pay it off. Thanks, Kenneth. You put it better than I did. There are few possible outcomes - none of them pleasant - but getting out of debt is actually the least painful one. I completely agree, you can't close your eyes to debt forever before it catches up to you. The last thing you want is to pretend it doesn't exist and let it come back and bite you later when you least expect it. Those creditors definitely did not forget about the money you owe them, you can run but you cant hide. Here is a good article to keep you on your toes about saving money http://www.cutbaddebts.com/top-5-ways-to-save-money-on-home-services. Don't spend money recklessly, learn to conserve!